Lock and load for explosive fun with friends in a free-to-play action based strategy game. Your mission is to command your loyal soldiers on a series of military raids to take out your dreaded enemies' bases. Blow up their bases, terrorise their territories and create masterful military tactics to earn victory on the battlefield. Be careful, brave squaddie - your crafty foes can strategically place sniper towers, anti-aircraft guns, mortars and other defences in your way. You can download this game for free and play it without making in-game purchases from PlayStation Store. Optional in-game purchases are available that may enhance your gameplay experience. Get blasting in a free-to-play military strategy game for PS4. Download GUNS UP! for free: Progress through the ranks with experience or by purchasing optional upgrades from PlayStation Store to supplement your armies, customise your characters or build larger bases. 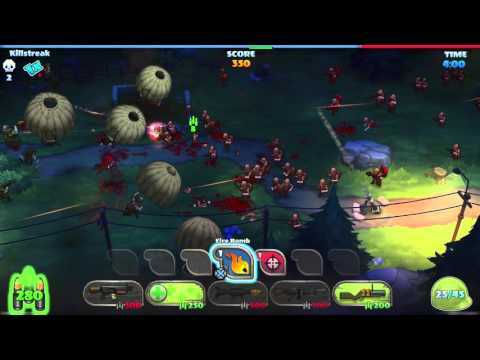 Find and destroy enemy bases: While connected online, you can build your army to obliterate opponents’ bases with asynchronous gameplay. Join a faction: Go it alone or team up with a larger group to form alliances with friends and dominate regions. Build and defend your base: Set up your military stronghold to keep the enemy away from your base, and test its strength against droves of real or computer-controlled opponents. Go solo in single player challenges: Tackle a set of replayable levels to earn perfect 3-star ratings.